Dear Guests! We are pleased to welcome you on site of our hotel «ALLiS HOTEL»! Would you gather to Yekaterinburg city with business trip, visit an exhibition, sport show or places of interest? Would you seeking hotel in the center of city? We are really excited to have you in our hotel «ALLiS HOTEL»! We would ready to offer your friendly personnel, cozy rooms and inexpensive costs. 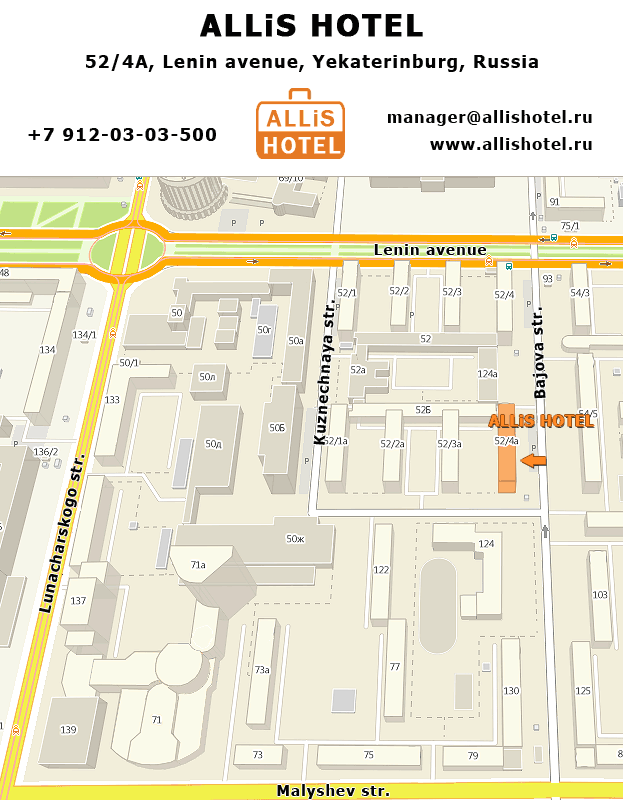 Hotel «ALLiS HOTEL» located at quiet center of Yekaterinburg. In a few-minute walk from us are business centers, exhibition centers, shopping centers, theatres, museums and historical sights. A lot of transport let you quick and easy reach any parts of the city. Each room of hotel equipped with comfortable beds with orthopedic mattresses, big flat TV with satellite channels, fridge, kettle, wardrobe, table. In two rooms there are individual safes. First floor of our hotel is equipped with small but very cozy kitchen with TV and dining table. In a few-minute walk from hotel located business and shopping centers "Vysotskiy", "Antei", "Grinvich" as well as square 1905, opera house, theatre of music's comedy, conservatory, philharmonic, administration of Yekaterinburg, embassies, Temple-on-the-Blood, cinemas, cafes, restaurants, bars, night clubs and many other. Calm in our hotel are guranteed by 24/7 administrator and CCTV. Our quite and homelike hotel with care about your comfort make your staying unforgettable with bright positive impressions.